Our system tracks the times that a card has spent in each column, then it adds those values together to form the Cycle time of a card. The Cycle time is configured per board. You can choose which columns from your workflow to be included for the calculation of the card "cycle time". For example, it is often appropriate to exclude the Backlog, Done and Archive columns from the cycle time calculation, as cards are not being worked on when they are in one of these states (this depends on your context). Cycle time begins at the moment when the new arrival enters “in progress” stage and somebody is actually working on it. 2. How to configure your Cycle time? The Cycle time is configured per Board. To configure your Cycle time → click the “Edit Workflow” icon of the respective Board. Both the INITIATIVES WORKFLOW and the CARDS WORKFLOW may have separate cycle time configuration (img.1). Note: In case that your Board consists of multiple Team Workflows, each workflow may have a separate cycle time setup too. Click the CONFIGURE CYCLE TIME link to the right side of each workflow to open the configuration panel. Kanbanize tracks the times that a card has spent in each column, then it adds those values to form the Cycle time of a card. 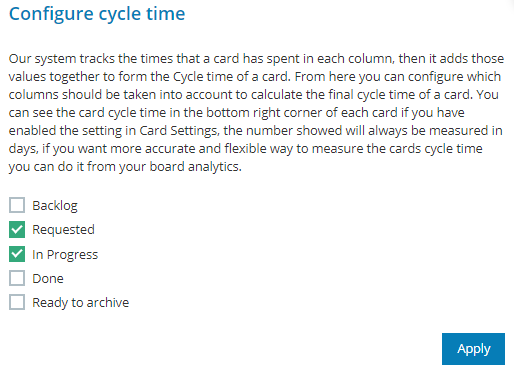 You can decide which columns should be taken into account to calculate the final cycle time of a card. Checkmark the columns that you want to be tracked. 3. How to make the Cycle Time visible to the closed card view? Тhe accumulated cycle time for a card gets displayed on the bottom right corner of each card in your board. Note: The number that you see will always be measured in days. To make this metric visible at the closed car view, you have to checkmark "Show Cycle Time" in the Card settings of the respective board. - Flows - one of the most popular charts in the Kanban world that shows the stability of your process over time. 4. 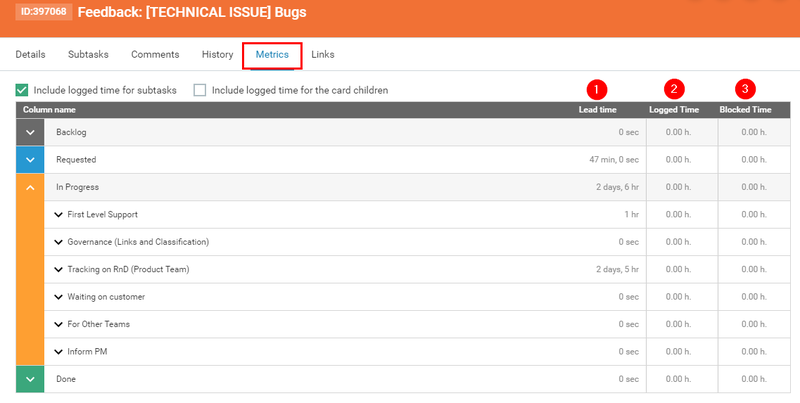 The card Metrics tab - lead time, logged time, blocked time. This card tab provides an overview of the: Lead/Elapsed time | Logged time | Blocked Time per column for every card on your board. Use the arrows to expand the view of the generic Kanban stages that are initially displayed (Backlog, Requested, In Progress, Done) and see all steps that represent your work process along with the logged metrics for the card. - the Lead time is the timespan between the task entering the flow until leaving it. Kanbanize automatically records the time each card has spent along the process: from the initial phase until delivery. The generic Kanban stages display the total time for the stage. * According to the best practices, lead time is better to be measured from the moment when a team member is committed to the new request. This way the average lead time in a Kanban system will be much more accurate. Otherwise, new tasks can spend months in a waiting queue before somebody has the capacity to start them and the lead time increases dramatically. - Logged time - this is the time manually logged by users and it shows how much pure time has been spent for a given card. - Blocked time - it shows how long a card has been blocked, respectively how much time it takes for a blocker to get resolved. The Block Resolution time chart shows how much time it takes for a blocker to be resolved. For more information on the time metrics, please read the following dedicated article: Cycle time vs Lead Time.